Pick a limited range of colours you like and stick to those. This will give your garden a clear theme and make it pleasing to look at. People tend to choose purple/pink/blue/white or yellow/orange/red. But contrasts with purple/orange/yellow can also look attractive. Once you have chosen your colour palette you can try a range of flower shapes and plants types to create interest. For hard surfaces such as paving, wood and brick only use three or four finishes/colours and make sure they complement your house finish. whereas Adam Frost created a vibrant effect with contrasting purples, blues, yellows and oranges. We tend to get excited about plants when they are in flower and forget that we may only see those colours for a few weeks each year! The rest of the time we will be looking at their leaves, stems and seed heads. 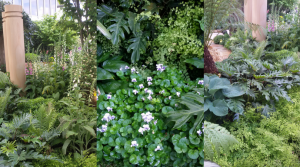 So to create year-round interest choose plants with usual and different foliage shapes and colours that can create contrasting textures. 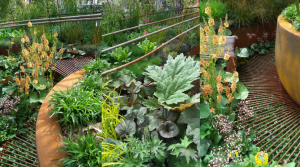 The ‘Dark Matter’ garden (right) included a wonderful range of foliage offset by rusty metal planters and piping. 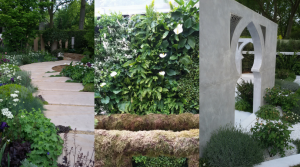 as did Charlie Albone’s exotic garden for Chelsea 2015 where foliage textures contrasted with smooth stone pillars and paving. 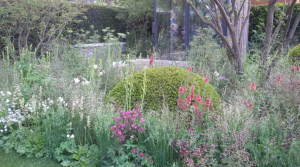 We need plants of different heights in our beds and borders to create layers of interest the garden. Traditionally, taller plants are put at the back of a border, with smaller ones at the front. However, spikes of tall plants on airy see-through stems can also be placed in the middle or front of a border as we can see through the stems to foliage and flowers at the back. 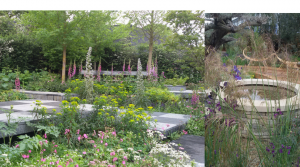 Darren Hawkes’ garden (left) used tall Echiums and foxgloves throughout to give colour and height. While Matthew Wilson (right) planted a tall grass, Stipa gigantea, which has tall flower spikes up to 6 foot high that you can see through. In a small garden it is difficult to give a sense of space and a variety of views when the boundaries (fences, wall or hedges) are always close. 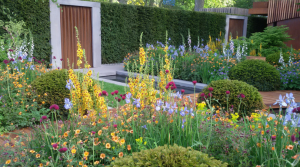 But the gardens at Chelsea show what can be achieved. framing features with freestanding walls (Kamelia Bin Zaal). 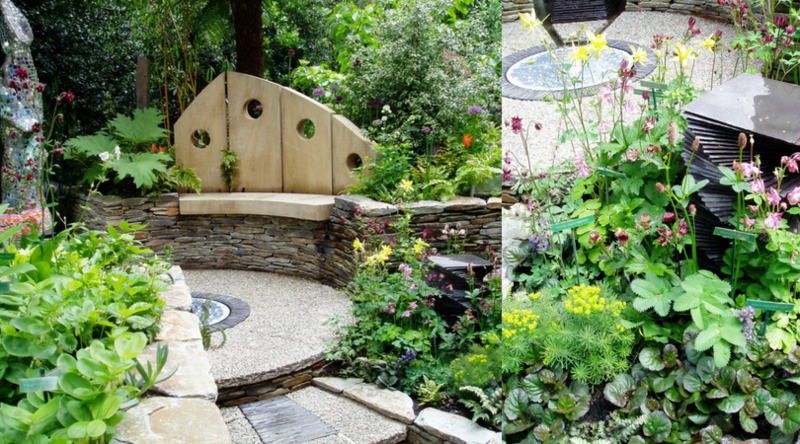 For more Garden Design advice look out for my beginners workshops in Lancashire and Manchester or contact me for a one-to-one advice session.